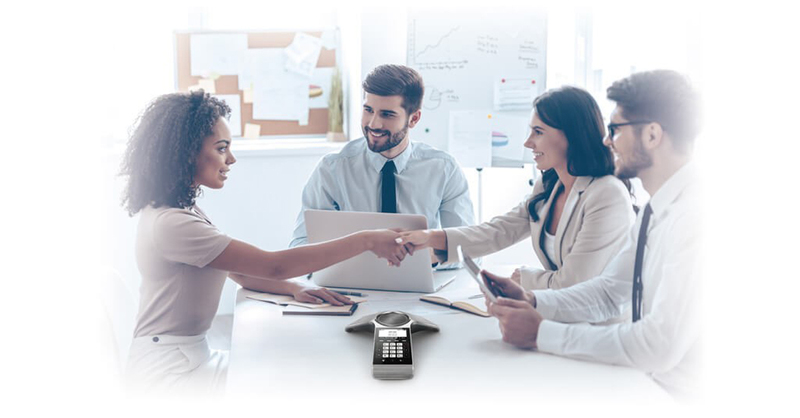 Equipped with the advantages of VoIP technology, the security and versatility of DECT, and the sound quality and enhancements of a full-featured conference phone, the CP930W is ideal for almost all business environments. Its support of SIP means that it can leverage any SIP-based IP PBX, irrespective of vendor, allowing it to be incorporated into the corporate telephony network. All features provided by the IP PBX are made available to the device, including conferencing, call hold, call park, call transfer, short-code dialing, and many others. Its wireless nature permits complete freedom of location, as long as you are within the coverage of your corporate DECT wireless signal. There is no need to search for power outlets or telephony jacks: just place it on a flat surface and dial. As a conference phone, it delivers exceptional audio quality, thanks to its 5-watt speaker and built-in 3-microphone array with 360-degree voice pickup. The device supports HD audio codecs for generating a more natural-sounding voice and a better overall experience. Some of the impressive characteristics of this product include a built-in battery that supplies up to 24 hours of talk time and 15 days of standby time. The conference phone can also be paired with a smartphone or tablet using Bluetooth, or with a PC using a USB cable, allowing it to be used as a loudspeaker and microphone. Such pairing can also be employed to merge calls on these devices into a single unified communications meeting. An SD card slot is also available for conference recording. The phone can also be used as a conference bridge for a 5-way conference call using the capabilities of the device itself. The number of participants can be increased with any additional features the associated IP PBX provides. The Yealink CP930W can be purchased as a stand-alone device and connected to your existing wireless DECT network, or it can be procured as a bundle that includes the Yealink W60B base station. As a Yealink DECT device, the CP930W enjoys the same advantages of Yealink’s other DECT devices, including up to 8 concurrent calls over the same base station, encryption over all wireless communications, and compatibility with Yealink’s DECT repeaters such as the RT30 to increase the wireless coverage area. By offering flexibility and versatility through the combination of SIP, DECT and conferencing in a single product, Yealink’s CP930W conference phone is a valuable innovation for all types of businesses. For the first time, you can now hold a conference meeting effortlessly, anywhere you have DECT coverage.